“The future of coding is no coding at all,” says Chris Wanstrath, CEO at GitHub. Take a trip into the future with us. Maybe you’ve already heard some buzz about no-code, or maybe this is your first exposure. Either way, knowledge is power and there is always more to learn (that’s why we say “nearly” everything there is to know!). Our goal is that by 2023, anyone can build an application, so we are motivated to learn everything we can to make that happen. We created this page to share what we think you need to know about how no-code works and why it can benefit you -- and we look forward to growing our knowledge even more the more we learn! So here we go, from no-code’s rise from the evolution of programming, to components of a no-code platform, to popular use cases and key benefits. Have more questions or missing some information? Just reach out to us for anything else you want to know about all things no-code. “Programming isn’t about typing, it’s about thinking,” says GitHub CEO Chris Wanstrath. No-code application development removes programming as the barrier between ideas and solutions. By making it possible to build applications without knowledge of coding, no-code platforms leverage technology to empower the ability of humans to innovate, rather than impede it. By enabling easier and faster development, no-code allows you to implement continuous delivery, adapt to ever-changing market needs and customer/business needs to make your organization what it needs to be. No-code platforms have evolved rapidly. You can go as complex as you like, the easiest way possible. Low-code platforms are intended to reduce development time. But if that’s the goal, why not remove coding entirely? This is the thinking that brings us to the current era of application development. The first programming languages were simple, but as technological requirements became more advanced and needs for software exploded, more- and more complex- languages were developed. Think of the difference between Pong-era video games and today’s MMORPGs, to get an idea of the magnitude of the evolution of programming. 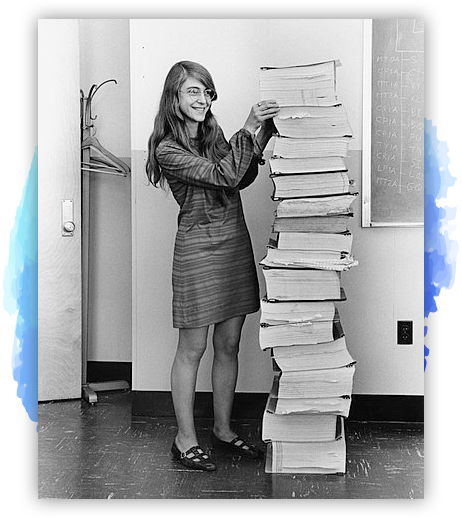 Margaret Hamilton joining NASA as the lead Apollo flight software designer in the 1960s and 70s demonstrated the magnitude of what programming could help humans achieve -- literally bringing us to the moon and back. This is why the demand for programmers is so high: There are always possible advancements in programming to push the boundaries of what we are able to achieve, and there will continue to be a need that is greater than the available resource of coders can meet. Linus Torvalds for example, who created Linux in the early 90s, has been outspoken in favor of an open-source model for software development because it encourages open collaboration and peer production when there is such a shortage of programming talent. The low-code movement also positions itself to address the demand for more programmers and faster development. Making it possible for developers to significantly shorten time to develop by reducing the amount of coding needed to develop applications, low-code applications reduced the amount of code needed to create applications. Application development with no-code platforms is 8 to 10 times faster than building with traditional coding or even low-code platforms. This is because no-code solutions are a lot less complex than applications that are based on traditional codes or low-code. Innovation is pushing the boundaries to continually improve processes, making development faster, better and more effective. And that’s exactly what no-code development provides. By addressing the increasing demands of digital business, no-code is able to surpass even the advances of low-code. Low-code platforms are often pitched toward developers as a tool to make their work much faster. No-code can do this too, but also opens the door to a new type of developer: the citizen developer. Citizen developers have an aptitude to use tools to their advantage to find solutions, but don’t need intensive training. Many are digital natives who grew up with and understand the value of software, so they are open to learning and implementing new tools that increase productivity and assist their workflow. With a no-code platform, you can equip more of your workforce--your citizen developers--with the tool they need to build business, web and mobile applications. The low learning curve makes it easier for you to grow your business. “How can you possibly build an application without writing a single line of code?” is a question that we hear quite a lot. 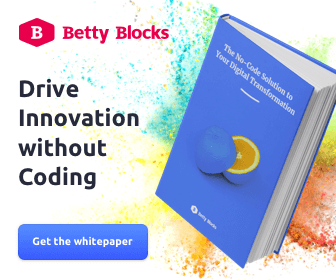 Here’s the secret: Betty Blocks programmers write the code that lays the foundation of the visual modeling elements that you then build your applications with. Essentially, when you build with a no-code platform you are building with code, it’s just hidden (so you don’t have to write it!). Rapidly drag and drop every web page together, just how you like it. From header to form to table and instantly see how it looks on mobile, tablet or desktop as well. Feeling venturous? Combine it with any JS framework - like Angular or Vue.js - for full freedom and flexibility. We replaced complex code for a drag-and-drop interface. 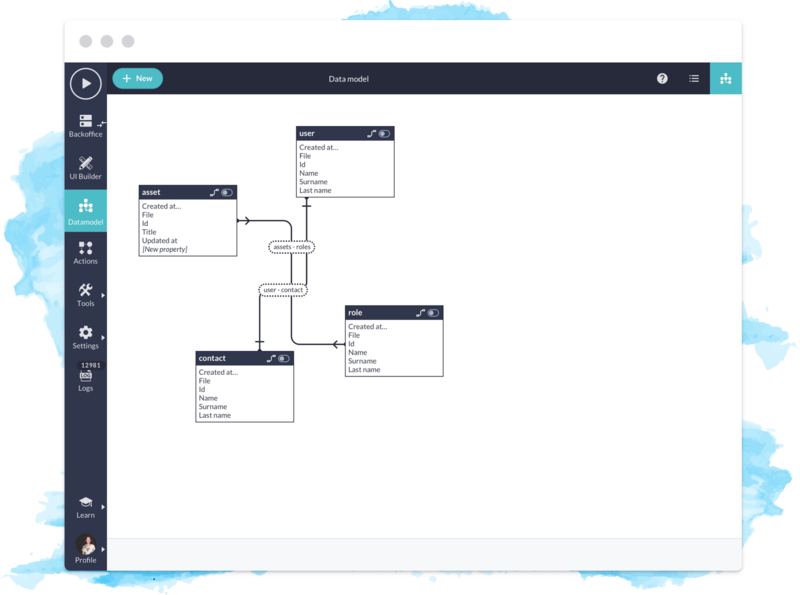 Process and manage your data easily through visually modeling. Fast, fun and easy with endless possibilities. (Small) parts of an application can be reused in new applications. Fast developing is great, not developing at all is even better. Plus, you can contribute to the community by offering your part in the Block store for others to (re)use it. 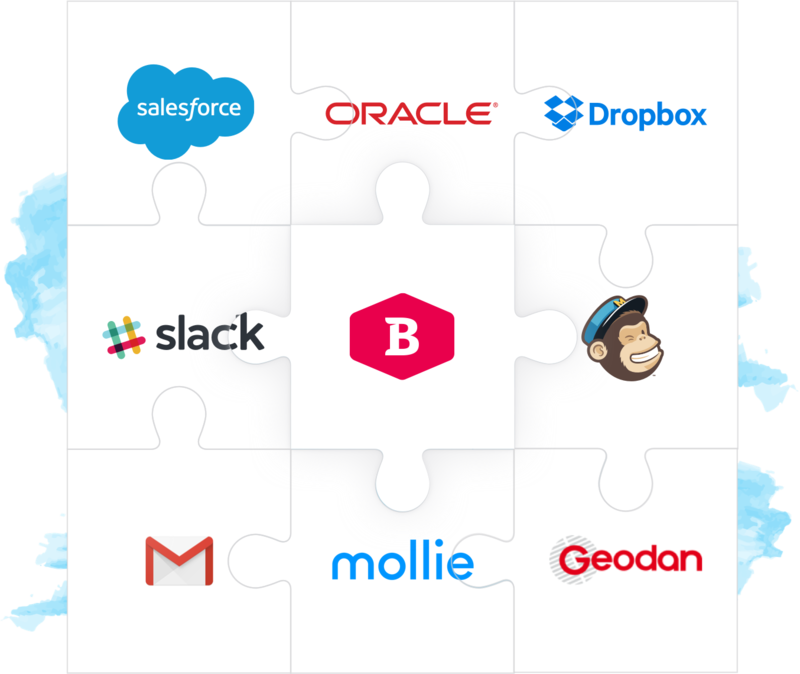 To connect everything you need, you can easily integrate with all kinds of web services like Slack, Twitter, Mollie or Ideal. The platform fits into every IT landscape and provides modern possibilities for legacy systems. 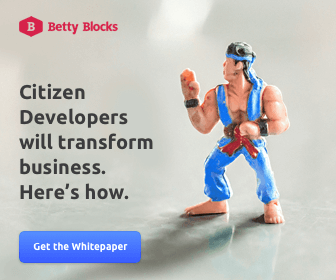 You can build three kinds of applications on a no-code platform like Betty Blocks: Back office (database), Web, and Mobile applications. All applications are hosted and run in the cloud. Improve your organization's internal operations! This application type uses a back office module only. It provides functionality to administer your business data for internal use. The back office module is already built and largely designed by us. Why? Because this module is often only seen and used by your employees. Speed up development and take advantage of the steps we have already taken care of for you. Use the out-of-the-box and ready-made features, such as filter, search, export, import, logic (workflows) and more. 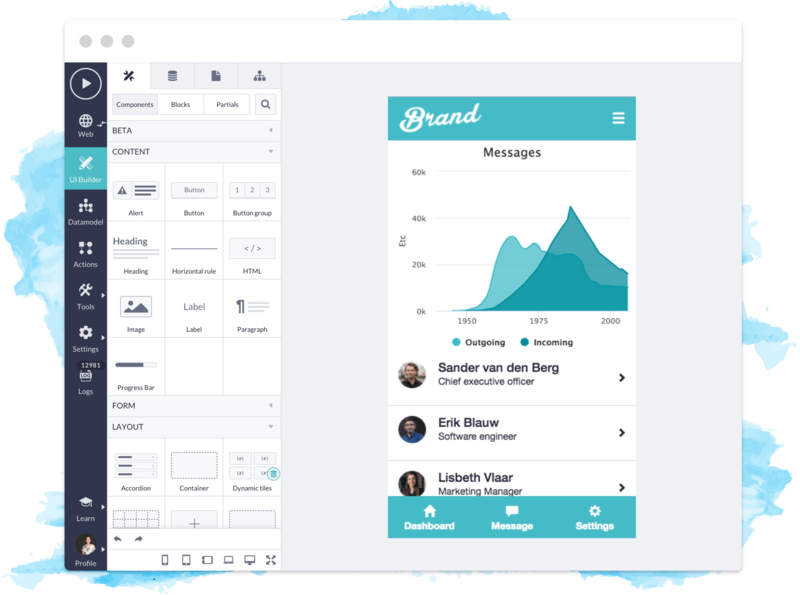 The platform makes it easy to visually create grids, forms, and workflows without programming. Take your mobile solution on the go! Build a mobile application and fully customize the front end especially for mobile devices such as tablets and smartphones, rather than large desktops. The application is web-based, and you have full access to all elements of the web browser. No software installation is needed. No-code platforms encourage the entire digital transformation process, from idea to experimentation to solution to innovation, by facilitating the effective and efficient implementation of a continuous stream of new ideas. No-code allows users to rapidly develop new solutions to transform business process and meet customer needs. The path to innovation can start with the business, then transfers to IT. With super accessible no-code platforms, there is no longer a barrier or long IT backlog to clear before taking steps to innovate: No-code clears the path forward. Industry experts Industry experts agree: No-code is driving the future of application development. The demand for applications is so high that we simply cannot keep up--there are not enough traditional programmers available to meet this need. This is the classic problem in application development today: The gap between IT departments and business demands. And no-code offers the solution to surviving the new era of application development. Regardless of industry, every company is in the IT solutions business. Whether you directly provide technology as a service, apps are involved in every aspect of your business. 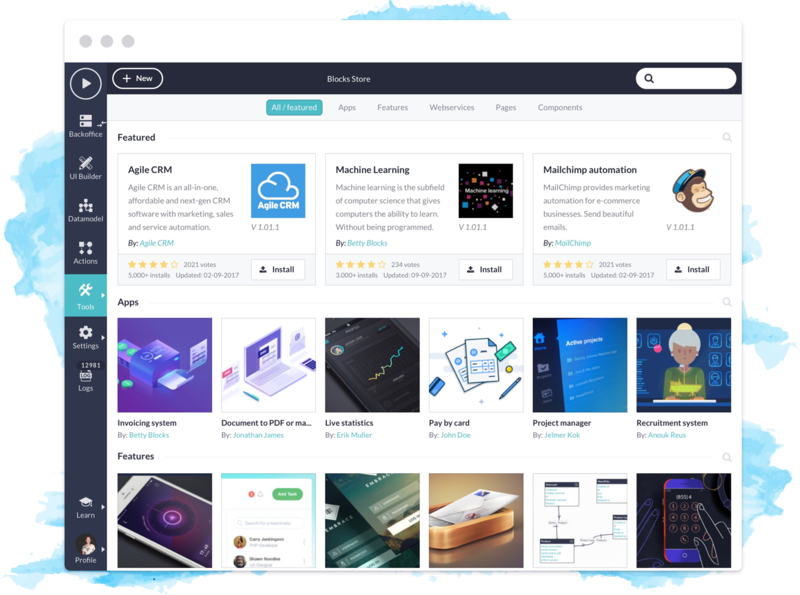 No-code presents a solution that is accessible to business developers and other professionals alike, and not just programmers or other techies. IT is the use of technical solutions outside of IT’s governance and authorization. This creates security threats and drains company resources. By sanctioning the use of a no-code platform, IT provides a regulated environment from the start and has full control. IT is swamped keeping up with the maintenance of existing applications. 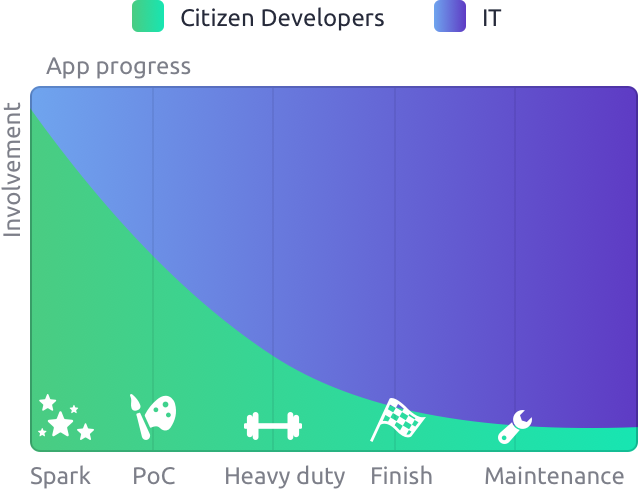 Delegate backlogged projects to citizen developers so that IT can focus on more critical concerns, and free up space for both IT and citizen developers to pursue innovation.